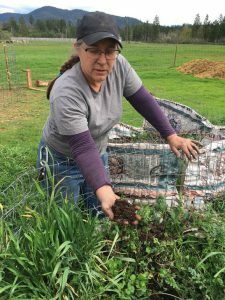 Kelpie Wilson is an active member of the Umqua Biochar Education Team (UBET), a group of volunteers near Roseburg, OR who are passionate about biochar, and whose purpose is to share their knowledge with others! Although they believe in the potential of biochar, they understand that before a farmer will use it on their field, there need to be demonstrable positive agronomic impacts of application. They decided to undertake a research project of their own to evaluate if they could show an impact of biochar on dry-land forage yield and soil properties. Specifically, they were interested in seeing the effects of biochar with their own eyes! Kelpie and other UBET members wanted to put together a practical, on the ground experiment that could be used to inform ranchers about biochar application. Since past research has demonstrated that biochar may affect a long list of variables, Kelpie decided it would be best to focus in on two main questions of interest: Can biochar improve dry-land forage crop yield and quality? Can biochar improve soil conditions? 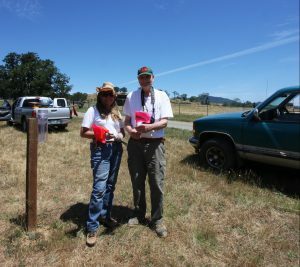 The group obtained permission to set up test plots in a pasture at the Duchess Sanctuary, a ranch in Oakland, Oregon that provides sanctuary for rescued horses. They also sought out a nearby source of good-quality biochar that they could buy in large enough quantity for a field scale project, and opted for a conifer wood biochar produced by John Mediema of BioLogical Carbon in Philomath, Oregon. Three amendment rates were applied to plots in a randomized block design. Kelpie and the other members of UBET wanted to set up a field trial that would generate meaningful data. Specifically, they wanted to set up a replicated experiment to be able to apply statistics and make statements about possible treatment effects. With this in mind, they laid out plots so each of their treatments—unamended soil, low biochar application rate, and high biochar application rate—were replicated seven times. They also grouped one replicate from each treatment together into blocks, or sets of co-located plots that were spaced across the study area. Plant growth and soil properties are impacted by many variables including soil nutrient levels, sunlight, slope, and soil moisture. These factors may diminish the opportunity to measure the effect of the treatment of interest. Blocking replicates together allows environmental factors other than the biochar amendment to be kept as consistent as possible. This helps researchers to reduce the impact of external factors, in order to measure true treatment effects. In year one, biochar was applied at three rates: Treatment A-no biochar, Treatment B-44 lbs per 1000 square feet (1% biochar by volume), and Treatment C-130 lbs per 1000 square feet (3% biochar by volume). 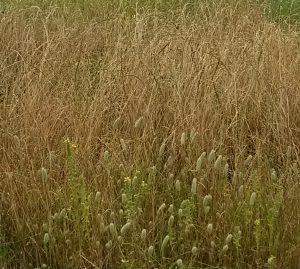 Treatments were applied to a 10 foot by 10 foot plots, tilled to 4 inches depth to incorporate biochar into the soil, and seeded with a mix of annual and perennial ryegrass. The same amount of fertilizer was applied to all plots. However, when the forage was harvested the following June (2015) there were no significant difference in plant growth or soil properties in amended plots compared to unamended controls. It became clear that higher rates of biochar application were necessary to measure a treatment effect. Thus, UBET members decided to reapply biochar at higher rates, about 10 times higher, in fact. That fall, they applied new biochar amendment rates: Treatment A—no biochar, Treatment B—500 pounds of biochar per 1000 square feet, and Treatment C—1000 pounds of biochar per 1000 square feet. 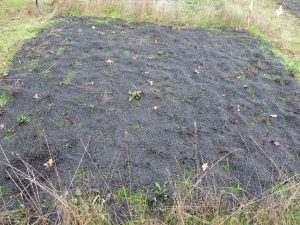 This time they left the biochar on the soil surface. Over the fall and winter, it seemed that the heavy amendment rate was smothering plants and suppressing growth. However, by the following June (2016), concerns were allayed as even those plots developed a thick crop of grass. When the UBET members harvested the forage they found no impact of biochar on forage yield or protein content, but there were measurable differences in soil properties. Specifically, biochar application increased soil pH, soil nutrient levels of phosphorous (P) and potassium (K), and soil water content. Additionally, biochar made soil temperatures cooler. Changes in soil properties are interesting in their own right, but are most useful to growers in so far as they have the opportunity to affect crop yield. Since biochar persists in the soil for a long period time, UBET members speculated that the long term effects of application may not be measurable in the first year or two. For this reason, they have decided to extend the duration of this project. Since UBET is working collectively on this project, they are taking good care to document everything that members are doing on the project, in order to monitor progress. Good records are important for all research. Biochar amendment did not increase forage yield, but did significantly increase pH, and at the highest application rate biochar significantly increased soil water content, phosphorous, and potassium. Engage local experts. Kelpie recommends involving your local extension agents and university researchers early on in your project. Although UBET members were passionate from the beginning about their field trial, they didn’t have the knowledge and experience that comes with formal scientific training. Local researchers can help you evaluate your research plans, and provide guidance on how to set up a trial that will clearly meet your objectives. Additionally, these experts many know of others in the area who have similar interests who you can partner with on your project. Sometimes the process is more important than the result. Although they did not see as many differences between treatments as they were hoping to, Kelpie and other members of UBET plan to continue using biochar and setting up more small-scale experiments. They are interested in monitoring the impact of biochar on forage production in dry versus wet years, and in continuing to evaluate if biochar is a good investment for farmers. Conducting scientific research in living systems, like an agricultural field, means that there is a lot of inherent variability that is hard to control. Unfortunately, this is the perennial struggle of agricultural researchers everywhere. Despite these challenges, UBET members are committed to continuing the work, and are having fun in the process!